I thought I would write one more “lesson post” based upon the inexplicable Denver Broncos loss to the Baltimore Ravens in the 2013 playoffs. Rather than riding a Mile High to the AFC Championship to face the New England Patriots, the Broncos coaches are now available to watch the “does anybody ever watch this” NFL Pro Bowl. You must have support “over the top” for your company’s social media strategy to succeed. Not everyone has the personality to maintain a consistent, non-threatening, non-defensive, and engaging presence on social media to represent your company. Make it clear that employees can’t simply represent your company without going through a vetting process (or being hand-selected based upon past performances). Will employees be sharing cat pictures or other humor to simply put a smile on the face of their fans/friends/followers? Will they give advance product announcements, take polls that lead to crowd-sourced product development, do customer service triage before taking issues offline? Will employees be granted permission to browse and post to social media channels throughout the day? Will you put guidelines in place to permit this multi-tasking as long as it doesn’t interfere with their overall job performance? This implies an integrated model where employees are tasked with other responsibilities besides social interaction. If you go with a dedicated model, then the employee’s primary responsibility is to maintain a consistent and engaging presence on social channels while representing your company. Where are your customers? Your customers want to be engaged wherever they choose to be. 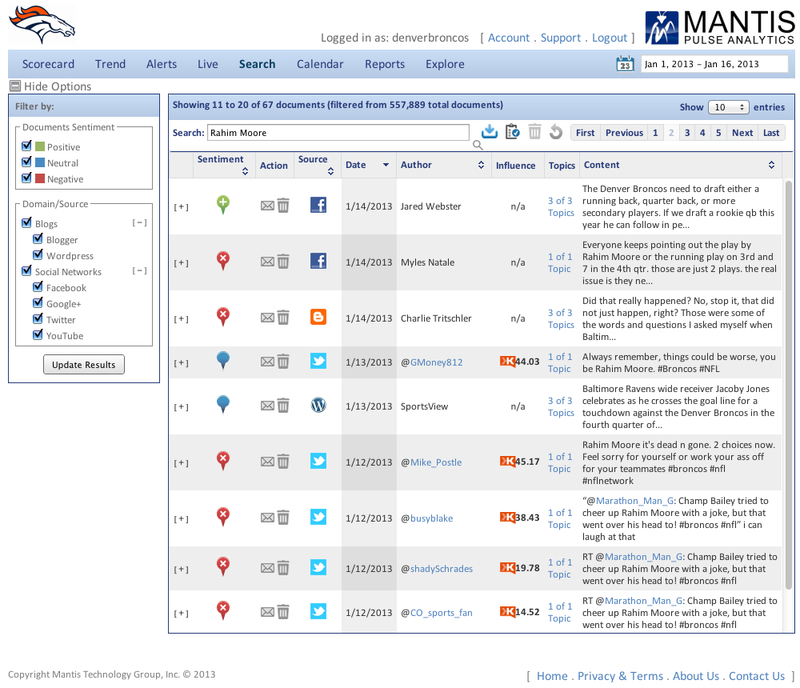 A monitoring tool like Mantis Pulse Analytics can help your company find those conversations. You then determine the appropriate resources to engage for that particular social channel. The most common channels will be Facebook, Twitter, LinkedIn, YouTube and Google+. However, your customers may be on Amazon, TripAdvisor, Yelp, Instagram, Pinterest…or some other specialized forums. Back to the first “over the top” support, leadership must answer the question: Why are we doing this? There must be a strategy, goals, and a measurement system in place to determine progress towards those goals. Are you increasing brand awareness, are you developing citizen influencers as advocates, are you monitoring to prevent customer service issues from going viral, are you doing what you can to increase the lifetime value of your customers? Knowing the “why” is crucial to support the “long view” of a social media strategy when results are not immediate. Will you only engage through established social media channels? Will you take the next step in “Owned Media” by hosting your own blog site where you can brand the content and not worry about it becoming prey to the whims of changing usage policies on channels like Facebook and Instagram? If curating content besides your own, will you support automation tools to provide the best experience to your readers versus bombarding their feed with 20 posts at 8am each morning? If we do our jobs as company leadership, then we can protect against any one of our employees getting “left on an island” and burned like the Denver Broncos secondary. The Broncos didn’t get burned just once…they got burned three times for long touchdown plays. The Denver Broncos playoff run did not survive the experience, and our companies will not survive getting burned in the media repeatedly. Provide support “over the top”! As a bonus, here is a screenshot from Mantis Pulse Analytics that provides a glimpse into fans’ sentiment after Rahim Moore got burned for that tying TD (Champ Bailey got burned for two TDs). Notice that the conversation happened on several channels (Twitter, Facebook, WordPress and Blogger just on this page of results). Let Pulse Analytics help your company find where customers are already talking about you! Note: These Pulse Analytics collections are for demonstration purposes only and do not imply client relationships between Mantis and the teams mentioned. Schedule a demonstration to see what consumers are saying about YOUR brand! This is a brilliant analysis. I think more and more football and everything else is about strategy, a plan and staying the course, or at least making adjustments based on good decision making, and trying to do the right thing. In football you can just watch mental attitudes win or lose the game. We see momentum change so often by just a simple little shift. I remember when a power outage shifted the momentum of a game for the team that “had it in the bag” and the team sure to win loses. Its the the Hawthorn effect, I suppose. Enough “waxing philosophically” you are absolutely spot on. With social media not everyone that has a Facebook account should be drafted to be a ‘player’ on the field or dress for practice to send out the Company message. gagasgarden Totally agree about making adjustments based upon good decision making. Also think attitude and body language go a long way to determining the outcome of a game…and life. And you still gotta pick the right players to “take the field” for your team and for your business.